The number of Tickets raised by the customers can come down in huge numbers once the Customer Community and Forums are set up. Before raising the ticket through website or by calling the support team; the users give a try to solve their issues with online research at the Customer Community. Setting up the Help Center and Community in Zoho Desk is straightforward. Creation of Forums specific to the department or product helps the customers to Ask a question, Propose an idea, Report a problem and Announcements.The other members of the community can share their insights about the post in the community. Forums are used to engage the Customers to increase the awareness about their product or service. Publishing the Articles in the Help Center Knowledge Base is a great way for customers to know more about the product or service.The common questions raised by the Customers can be put in the FAQs section of the Customer Portal so the Customers get the answers without raising the Ticket.The other advantage of Customer Portal is that the customers can submit their Tickets and can check if the raised Ticket is attended by the support team. Nowadays customers are actively participating by posting their issues on Social Platforms. It is a must for companies to show their presence on Social Platforms. Zoho Desk can be integrated with Social media – Twitter and Facebook. The following are the benefits of integration between Zoho Desk and Twitter, Facebook. Converts the Posts or Tweets into Tickets in Zoho Support. Business owners want their business to be automated.This automation is possible in Zoho Desk with Workflows.Sending of automated email, assigning of task and field update when certain conditions are met is possible through the workflows.Workflows helps the employees not to miss any step in the process and allows them to follow the established system. On purchase of Product or Service, customers expect support from the Sellers until they are good at using the Product or Service. Contracts in Zoho Support helps the Sellers to support their Customers if they face any issue of the product, by entering into a contract with them. SLA’s demand a special attention from the employees in closing certain Tickets as they will be escalated if the tickets are not closed in certain time period. Creation of SLA’s increases response rate and brings satisfaction for high end Customers. 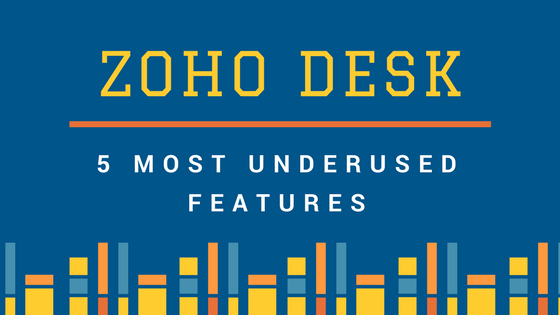 Many organisations also schedule the Zoho Desk reports to send them to specific users at predefined day/time. Dhruvsoft provides implementation and support services for Zoho Desk. Contact us to know more about our Zoho offerings. I want to thank you. Good job! You guys do a great blog, and have some great contents.